Passages to the Past: new book in the Morland Dynasty series coming out in November! new book in the Morland Dynasty series coming out in November! I am avidly working away on a post highlighting all of the novels in The Morland Dynasty and came across the latest in the series, book #33, The Dancing Years which is being released on November 4, 2010. SYNOPSIS: 1919. As the euphoria of the Armistice fades, the nation counts the cost: millions dead or disabled, unemployment, strikes and shortages. As prices and taxes rise, it becomes harder to remember what the war was for. Teddy tries to recreate balance but then a trip to France to see the place where Ned fell has unforeseen consequences; Polly, grieving for Erich Kuppel, persuades her father to send her to New York. 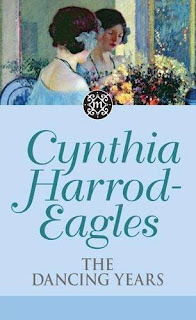 Despite Prohibtion, the great city, pulsing with life, promises her a fresh start; Jessie and Bertie, detained in London by Bertie's job, long to start their new life together; Jack becomes a pioneer of civil aviation, but when the company fails he's faced with unemployment, with a growing family to support. The generation that saw things no man should see must find relief from their own memories. A new world is struggling to be born out of the ashes; but as long as the music lasts, they will keep on dancing. Eventually but I have to start with the Founding which i do have in my grubby little hands!!!! I have to finish a few other things first though. Someone donated this set to our library. Unfortunately, few people checked them out, so they were deleted. I don't believe anyone here in rural TN was familiar with the author. The woman who donated them had just moved to the area. It is a shame, I tried to introduce the series to more patrons.